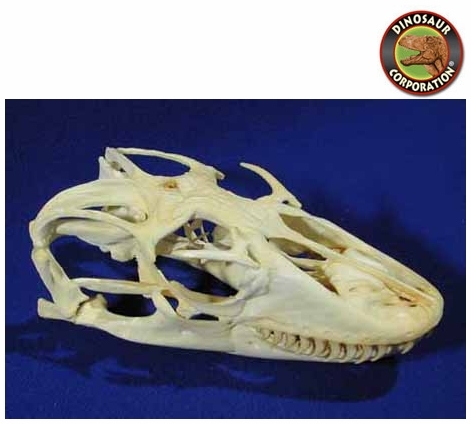 Komodo Dragon Skull. Varanus komododoensis. Adult female. The Komodo dragon (Varanus komodoensis) is a species of lizard that inhabits the islands of Komodo, Rinca, Flores, Gili Motang, and Gili Dasami, in central Indonesia. A member of the monitor lizard family (Varanidae), it is the largest living species of lizard, growing to an average length of 2 - 3 meters (approximately 6.5 - 10 ft) and weighing around 70 kilograms (154 lb). Their unusual size is attributed to island gigantism, since there are no other carnivorous mammals to fill the niche on the islands where they live, and also to the Komodo Dragon's low metabolic rate. As a result of their size, these lizards are apex predators, dominating the ecosystems in which they live. Although Komodo Dragons eat mostly carrion, they will also hunt and ambush prey including invertebrates, birds, and mammals.